Mammoths, mastodons, and giant beavers! We look back—wayyyyyy back—and explore the terrain that is now Toronto, as it developed through the ages. A creature makes its way doggedly along the sloping floor of a shallow, subtropical, Paleozoic sea. Its body is low, flat, and roughly the size of a phone book. The eight segments of its thorax separate a triangular tail from a nearly-identical triangular head. From the latter protrude two bulging, calcified compound eyes. The top of its body is protected by a hard, mineralized exoskeleton. Underneath, it collects oxygen from the water through gill filaments attached to its tiny articulated legs. Two long spines extend backward from the corners of its head. It is a trilobite, and the sea bed over which it travels will someday be Toronto. The creature passes corals and sea stars, while minuscule worm-like vertebrates—so-called conodont animals—swim by overhead. Nearby sea lilies reach for passing food with their feathery arms, like starfish laying on their backs, tethered to the sea floor on long stems. The world is already ancient. 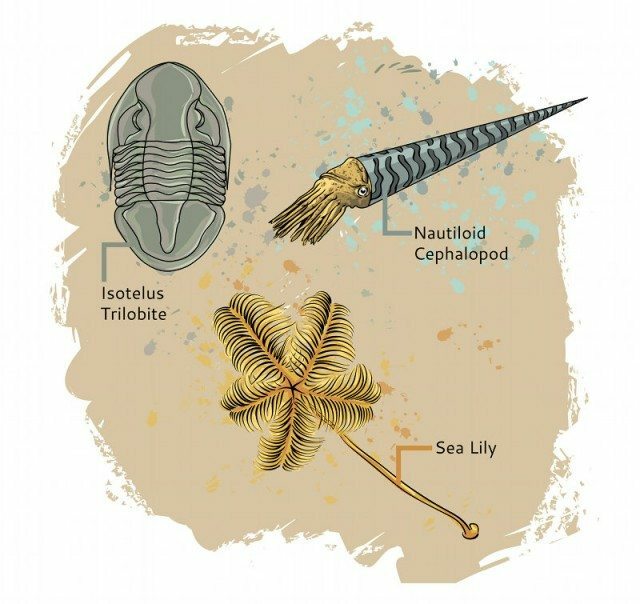 A hundred million years earlier, the Cambrian explosion—a period of intense biological diversification—produced the ancestors of almost all the animals alive today. Two billion years before that, photosynthesizing bacteria began releasing oxygen into the planet’s previously unbreathable atmosphere. And another two billion years back, an object the size of Mars floated into our solar system, crashed into a nascent earth, shattered, and reformed as our moon. When this trilobite was alive—450 million years ago, late in the Paleozoic era’s Ordovician period—the world was a very different place. The sun rose and set on some 390 shortened earth days each year. There was no polar ice, and water from the oceans flooded across the land, pooling into shallow seas. North America was part of a supercontinent called Laurentia, and present-day Toronto sat 10 or 20 degrees below the equator. Trilobites were plentiful here then, and their fossils have regularly turned up in exposed Ordovician rock by the Humber River, Etobicoke Creek, and Don Valley Brick Works. Some 5,000 different genera of the invertebrate—which belonged to a group of still-thriving organisms called arthropods—have been identified. One of the trilobites most commonly found in Toronto, known as Isotelus, was among the largest to have existed, sometimes reaching 30 centimetres in length. For Isotelus, life in the Ordovician was pretty good. One such predator was the fearsome nautiloid cephalopod. Abundant in Toronto during the Ordovician—where it grew as large as two-and-a-half metres in length—this invertebrate housed its soft body inside a long, conical shell, from the wide end of which spilled its many grasping tentacles, its mouth, and its parrot-like beak. The top predator of its time, the nautiloid propelled itself when swimming—which it usually did backward, leading with the point of its streamlined shell—by pumping water in around its gills and then squeezing it back out through a funnel of tissue. Often, a trilobite was especially easy prey. Like its present-day arthropod cousins—the spider, the scorpion, and the crab, to name a few—a trilobite could not grow without periodically molting. After shedding its old exoskeleton, the suddenly vulnerable soft-bodied animal would have to scurry into hiding while it remineralized a new one. This molting procedure was frequent. Despite the awkwardness of this molting procedure, trilobites managed to exist for more than 280 million years, and their appearance and extinction neatly bookended the Paleozoic Era. They popped up in marine ecosystems the whole world over, and developed specialized forms across their more than 20,000 species in order to adapt to different environments. They were resourceful and hardy, but they were not completely invulnerable. Very soon—in terms of geologic time—after our Isotelus’ sea-bed stroll, the first of three Paleozoic extinction events would decimate trilobite populations the world over. Marine life would quickly rebound in the ensuing Silurian and Devonian periods, with the appearance of large, jawed fish. But whether they existed here in Toronto is unknowable. At the end of the Ordovician period, Toronto’s sedimentary rock record—scientists’ only means of learning about what life was like in prehistoric times—would disappear for more than 440 million years.